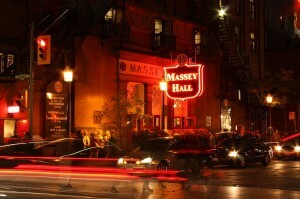 Massey Hall is arguably Canada’s greatest venue. It’s the right size, it’s beautiful to look at1, a perfect location, and most importantly, the sound… the sound is what a great concert should be. Belle & Sebastian, you fucked that up. The sound was muddy, at best. The vocals were buried, and for a band who prides themselves on the harmonies, this is a shame. Chris Geddes’ keyboards could barely be heard and your backing string section was made mute. The backing music slowly picked up and became the stunning sound that Belle & Sebastian are supposed to be, and the rest of the set was more than a delight. What really stood out however, was their main-set’s closing number, “Sleep The Clock Around.” While I’ve never been a huge fan of that song, I was in awe and thrill as I listened to that song. The sound was perfect for that perfect closer.